Of all the site furniture out there, Landscapeforms is one that I find myself using often. Many of their product lines have a simple and appealing design aesthetic. They also have all of their products available for download as SketchUp files. This is nice, but a bit inconvenient if you are in Revit. SketchUp files will work in a pinch, though imported geometry is not great (curves are always segmented and Revit materials cannot be used). 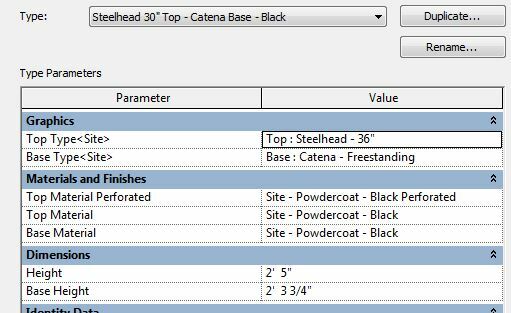 After looking through a few of their products, I decided the generic, yet versatile Tables, would be an excellent candidate for a Revit component. It has 4 bases and 14 different tops, not to mention an umbrella hole option and dozens of material combinations. So, here is the highly parametric and customizable Landscapeforms Tables family. These are the 4 types that currently exist within the family. The top and base are both controlled via a Family Type parameter. There are 3 materials, Base Material, Top Material, and Top Material Perforated (only for the perforated top). Height controls the height of the top, with Base Height adjusting the base. The dimensions shown above are the default for all types, which may create some discrepancies depending on the Top Type (the top may not actually “rest” on the base, though that can be adjusted). To get a top with an umbrella hole, scroll down to the Top_U types, which are identical except with a hole and matching base sleeve. There are also a dozen or so materials included, with only some of the standard powdercoated colors.